ZOOLOGY. The casting off of a part of the body by some animals (e.g. lizards, crabs) as a means of escape. 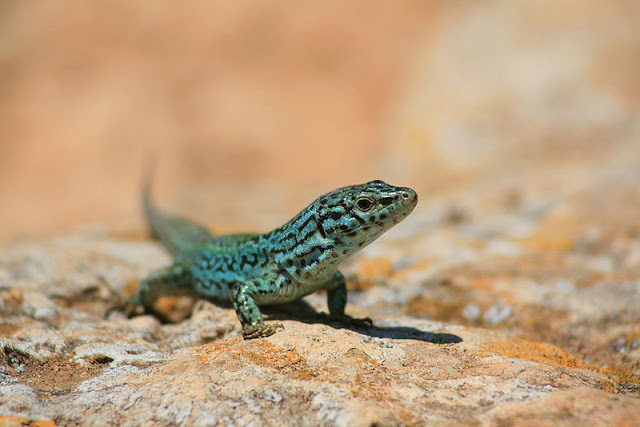 At some point, we've probably all taken an innocent interest in a lizard or some other reptile, only for the poor thing to subsequently shed its tail and scamper off with a bloody stump, leaving us thinking: "Oh yeah! I forgot lizards do that." This is autotomy; some lizards do it, but also some geckos, skinks, salamanders, octupi, crabs, brittle stars, lobsters and spiders. It's a self-defense and anti-predator mechanism, relying on the predator taking more of an interest in the autotomised (and expendable) body part than in the full prey itself; some shed parts (such as tails) even continue to wriggle and twitch in order to keep the predator's attention. Interestingly, in the case of a lizard that can perform autotomy of its tail, it has specific fracture points in the skeletal structure of the tail in order to facilitate easy shedding. In many such creatures, autotomised body parts do regenerate (a field of interest to scientists with regards the human body's capability to perhaps regenerate lost parts). This regeneration is even used commercially in the practice of declawing crabs. Basically, crabs are caught, have their claws pulled off, and are then returned to the water. The thinking is that, as the crabs will regenerate their claws, this is a system of sustainable fishing. The practice is controversial, however, as crabs (in test conditions) have a higher mortality rate after being declawed and it's unknown how much stress, pain or suffering it inflicts on the crab. For a less grisly and altogether more psychedelic anti-predator mechanism, it's worth reading up on aposematism too. This reminds me of the movie 127 Hours. The Oarfish is perhaps the biggest creature to perform an autotomy. Would take some seriously large creature to attack this monster that has been found up to 17m long. See the picture.